Ten rounds loaded with 225-grain Barnes XPB bullets. The Barnes bullet is a homogeneous solid copper hollow point bullet, designed primarily for hunting but can perform as a defensive round when extreme penetration of metal and glass is desired. The Barnes bullet retains virtually 100 percent of its weight and provides deeper penetration than most conventional bullets. Starline nickel-plated brass. Ten rounds loaded with 240-grain Speer Gold Dot Deep Curl Soft Point bullets. 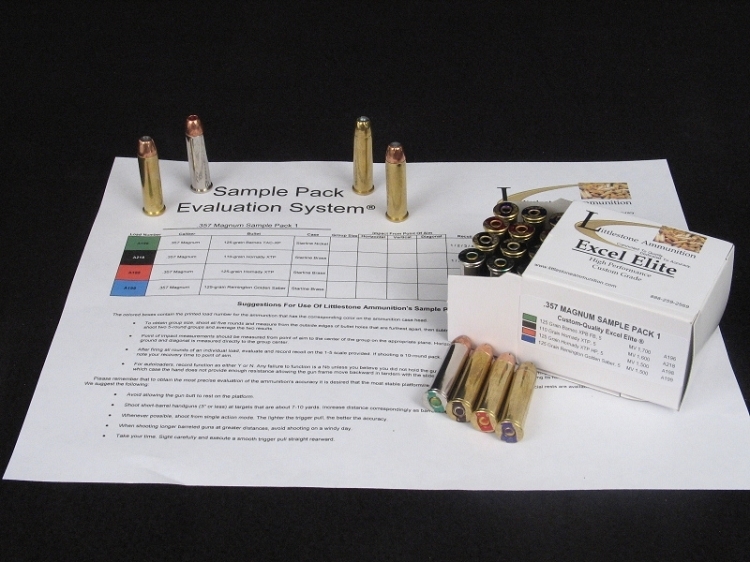 Gold Dots are bonded bullets manufactured in multiple basic steps. First the core receives the bonded jacket; next a cavity is installed with predetermined expansion folds; and lastly the final cavity shape and volume are set for the optimum performance for the cartridge and intended use. The bonded construction provides exceptional weight retention, which promotes penetration. The soft point bullet is a good choice when deeper penetration on game is desired than that typically produced by the hollow point, which is a good choice for small to medium thin-skinned game. Starline brass cases.